Jamaicans for Justice (JFJ) launches The 2006--2007 Jamaica Justice Report---"For Want Of A Nail", held at Terra Nova All-Suite Hotel, Waterloo Road on Tuesday May 15, 2007. 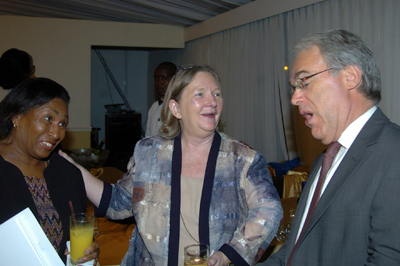 Here are Attorneys At Law, Dorothy Lightbourne (left); Nancy Anderson (centre); and British High Commissioner Jeremy Cresswell (right). Caption: Jeremy, yuh caan get her son a visa? No, no, no. Don\'t think I can Nancy..
Caption: British High Commissioner Jeremy Crosswell serenades Dorothy Lightbourne and Nancy Anderson with his rendition of \"I DID IT MY WAY\"
Caption: Attorneys At Law, Dorothy Lightbourne (left) and Nancy Anderson (centre) look on as British High Commissioner Jeremy Cresswell (right) swallows a frog. Caption: British High Commissioner Cresswell gasps in disbelief as attorney Lightbourne and Anderson express thier matrimoniary intentions. Caption: Dorothy: a glass of orange juice $50. a black jacket $1500. Hairstyle $900. White folder $400. listening to another one of Jeremy jokes, clueless. Caption: Jeremey Cresswell, almost speachless, gasps: \"Wow, I thought you told me this was only orange jusice!\"
Caption: After three rum cocktials, the British High Commissioner launches into a loud rendition of \"Day-o\", much to the delight of the ladies!